WhatsApp is known as one of the very best chatting platform world wide, with WhatsApp you can easily send messages across to your friends which is very fast and easy to use. right now there's a new added feature on WhatsApp This latest feature allows you Pin up to 3 (three) chats to the top just as we have in some online forums. However the ability to Pin chats on whatsapp has been added, we know some many whatsapp users will be so pleased with this newly added feature most especially for those of us that have numerous number of conversations from so many people. 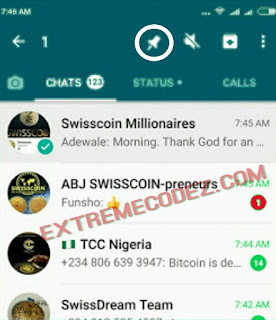 This safe from wasting your time searching for your for your favorite chats but with this latest update, you can simply Pin your favorite chats at the top. Meanwhile, this newly added feature is only available on the WhatsApp Beta Version WhatsApp Beta version 2.17.162 (and now 160). In other words, you won't be able to access it on the regular whatsapp application, except you are using WhatsApp Beta. Hoping that they do extent it to the main whatsapp soonest. >> Firstly Download WhatsApp Beta 2.17.163. If you don't have it installed to your device already. >> Next, install it on your Android device and launch/open it. >> Right click and Hold on any chat and you’ll get a new Pin Icon in the action bar next to the Delete, Mute, and Archive functions. NOTE:- You can only pin 3 (three) chats for now after which you will get a small toast notification message saying you can't pin more. Whatsapp keep on improving by the days as time goes on we hope it extend to the regular version of whatsapp.